In order to assess the extent to which tidal stream environments are exploited by a range of seabird species a series of boat-based surveys were carried out at the FoW site. A total of 101 zig-zag and vessel-based transects were performed using the Marine Scotland Science research vessel FRV Alba-na-Mara. During transects, the vessel moved against the prevailing horizontal currents. This unconventional design allowed the vessel to maintain a reasonably consistent trajectory despite the fast horizontal currents, and also sustain speeds suitable for recording foraging seabirds (5–15 km). Transects were spread across different tidal states to capture variance in the location and extent of hydrodynamic features. 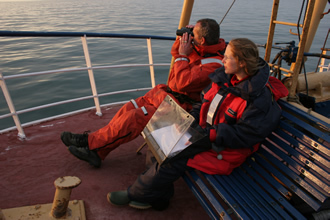 Transects were only performed when the sea state was less than 3 (Beaufort scale) and visibility was at least 300 m.
During transects, two observers sat 5·6 m above sea level at the bow of the vessel and only recorded seabirds seen on the water surface. Flying seabirds were not recorded as they would not be actively foraging. Survey methods were based upon those outlined within the European Seabird at Sea (ESAS) methodology. To provide accurate positions, observers recorded seabirds seen on the sea surface into 1-min intervals, and only when they were perpendicular to the bow. Whenever seabirds on the sea surface were seen flushing before they were perpendicular to the bow, observers noted their approximate distance ahead of the vessel. Each observer covered one side of the vessel, and it was noted on which side seabirds on the sea surface were observed. These approaches enabled the position of any seabirds seen on the sea surface to be quantified with an estimated accuracy of approximately 300 m in most cases. Observers also recorded the behaviour of seabirds seen on the sea surface to discriminate between those which were actively foraging (diving or searching) and those which were resting. For further details on the methods and results of the survey refer to the following link: http://onlinelibrary.wiley.com/doi/10.1111/1365-2664.12646/full. The study was performed across a total of 6 and 8 days in May and October, respectively during both 2012 and 2013, with May representing breeding seasons and October representing non-breeding seasons. EMEC Fall of Warness Boat-Based Wildlife Surveys (RESPONSE Project) is located in United Kingdom.